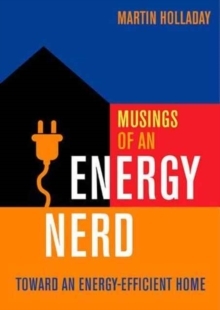 Martin Holladay has been making weekly postings to his 'Musings of an Energy Nerd' blog on Green Building Advisor since January 2009. Along the way, he has gathered a devoted following of energy nerds who await his weekly musings with rapt anticipation. For the first time, the 50 most popular postings have been assembled in book form to give homeowners a great opportunity to live a more energy-efficient life in their homes. The book begins with an overview of energy priorities, and a discussion of what we mean by terms like green and sustainable. Martin presents several options for energy upgrades for an existing house (from replacing windows to adding superinsulation) before looking at ways to improve the energy efficiency of a new house. Separate chapters follow on HVAC, domestic hot water, appliances and renewable energy, before the book wraps up with an eye-opening chapter on useless products, scams and myths.